Digital painting is an emerging artform in which traditional painting techniques such as watercolor, oils, impasto, pastels. are applied using digital tools. no magic "one click" computer program filter can give you such effects. The whole Original Art piece was painted with digital brush strokes ... one stroke at a time; building layer by layer to create depth and blending colors like with any art painting done with traditional media.A Custom - Commissioned Portraiture makes a Wonderful gift for your Special Someone. This is a special price offer on a Digital painting PERSONALIZED Quality Art Work done in the computer and then printed. Size 11" X 14" DIGITAL ART painting created and Printed with Archival Inks on High quality Mate heavy weight paper . (The Pictures shown here are only few samples of my Art , visit my web site page for more Pictures and different art media). This is A COMPUTER GENERATED DIGITAL ART Painting ,"digital art" is artwork created on a computer. working with specialized painting software , carefully working pixel by pixel, or "cell-by-cell" ; Portrait subject features are study meticulously inch by inch for a successful finish piece of Art. Many hours of dedicated work are put into each commissioned digital portrait. Excellent quality work you will love the results! At least 2 to 3 clear Pictures from your pet are required and you choose the pose. Photos can be sent via e-mail or regular mail ; all pictures will be returned with your Final Piece of Art in 2 weeks after payment and pictures are received. All my Portraits are Created with full dedication and care. 100 % costumer satisfaction! -Makes a wonderful Gift! 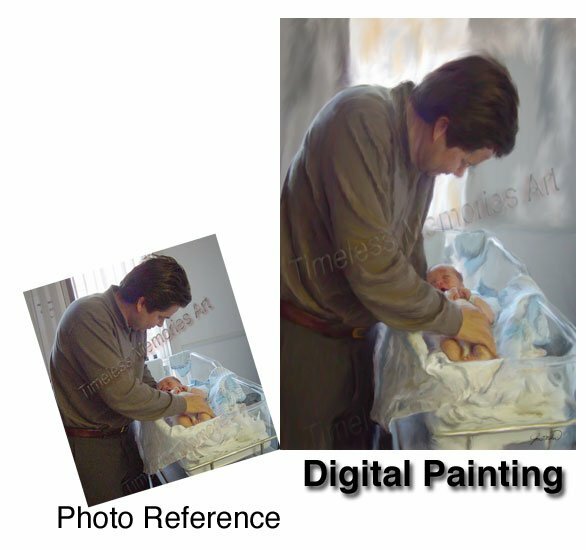 When your Art is completed I will send an e-mail preview for you to approve to make sure it is to your satisfaction, ( if changes need to be made please let me know at this stage); once I get final approval on your digital painting- your commissioned portrait is carefully wrapped and ship to you.